I just finished the second portion of the floor refinishing project in my house. 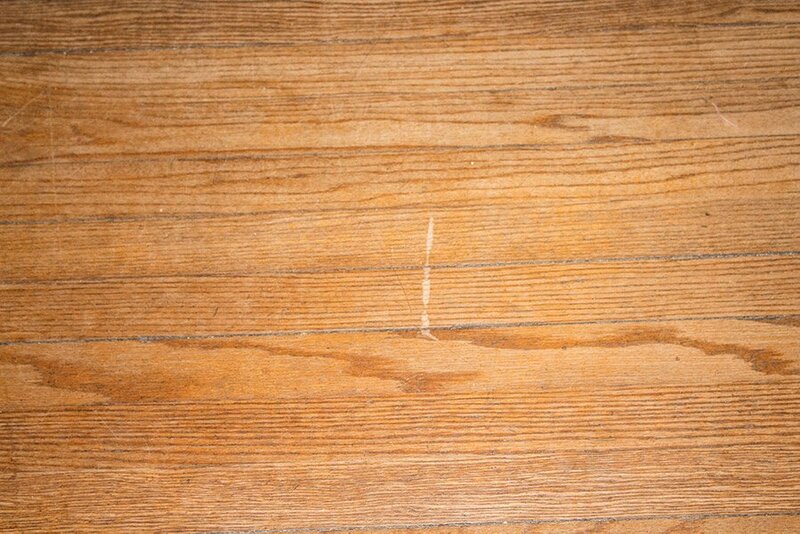 To recap a bit, the floors in my house were severely damaged, with deep gorges, many stains, and the finish straight up worn away in many places. I suspect they’ve never been refinished or re-coated in the 108 year history of the house. Since I’m DIY-ing this, and I need a place to put my furniture while I refinish the floors, I decided to do the house in stages. I started small, with the front room, which is a very small room that took about 3 hours to sand. That project was completed a couple months back (and if you want to see how I dealt with a bad sander that day, click here!) This time, I was conquering a much larger section of the house: the living and dining rooms. I wised up a bit: I intentionally planned this project for when my dad was in town, so I’d have a helper. We went to a different rental place, in hopes of getting a better sander than I had last time. I thought it would go faster, and that I’d do a better job. My floors look better than they started, for sure. But they're not the beautiful, flawless works of art that pros are able to produce. And I thought about this a lot. I researched. I planned. And I’d done it before! 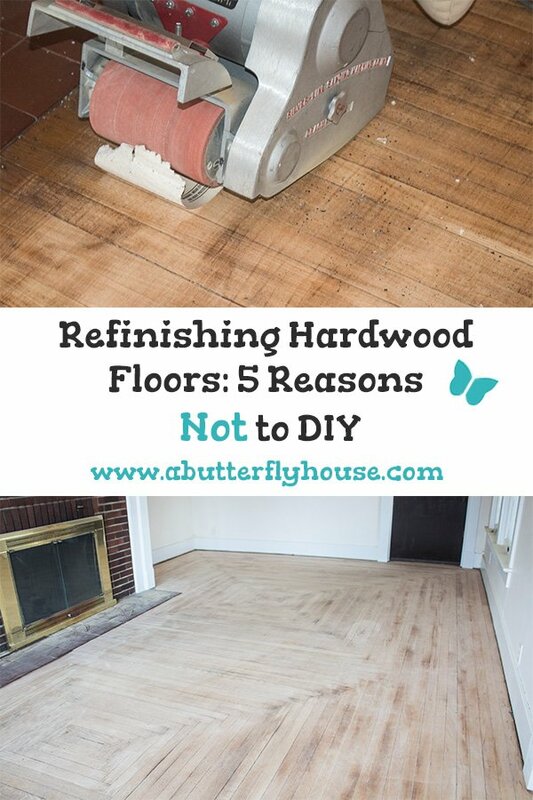 So I thought I’d let you know why this project is so difficult to do well, from two generally handy, but relatively inexperienced in refinishing people, so that you can make an informed decision on your own floors. 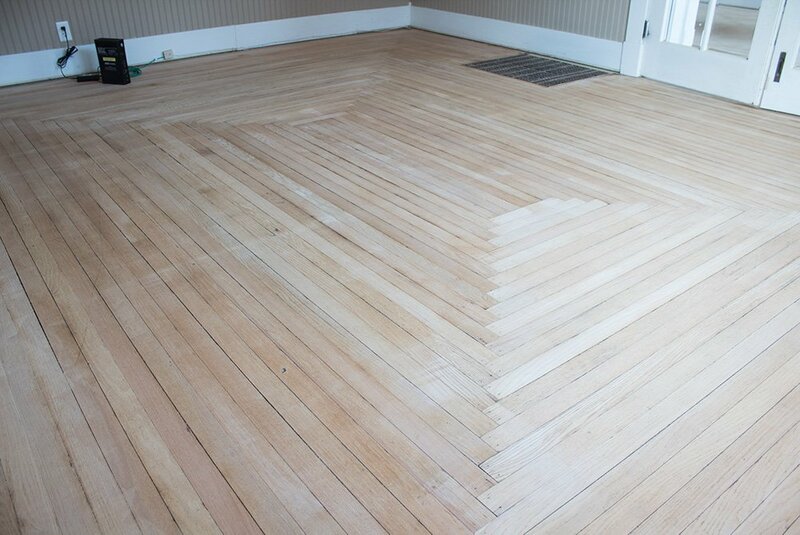 Not quite the even, flawlessly sanded floor I was hoping for. I panicked a bit, but eventually figured it out. This time I went somewhere else in hopes of getting a better sander. But 30 minutes in, the sandpaper kept exploding off the belt. We went through 4 different sandpaper belts in the span of 30 minutes trying to figure out what was wrong. Eventually, after driving back to the rental center, we learned the instructions the rental guy had given us for installing the sandpaper were incorrect, resulting in the sandpaper explosions. The sander that you rent will be a nice, heavy 110 volt machine that plugs into a typical household outlet. But the pros use even bigger, more powerful 220 volt machines that take off wood and finish faster. If you think the rental sander is probably good enough, you’re half right. It will get the job done. But it will take a lot more effort on your part, and more than one pass with the sander to take off all the finish. To give you an idea, here’s what my living room floor looked like after my very best effort. I passed over each spot with the 36 grit sandpaper, incredibly slowly, applying pressure, four separate times. Then the 60 grit sandpaper, twice. Finally the 100 grit sandpaper, which I only did once. Despite all of this, there are still finish marks on the floor. The end result will be blotchy because I couldn’t get the wood to an even color. 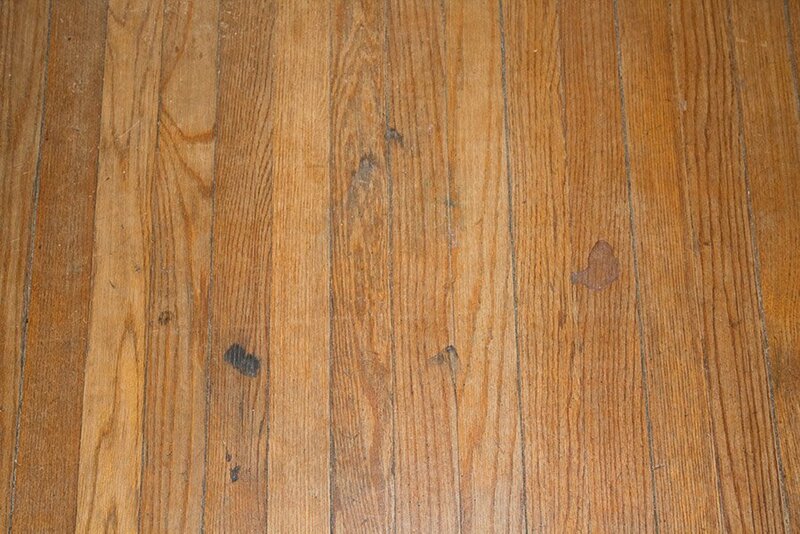 Admittedly, my floor is over 100 years old, and pretty warped. 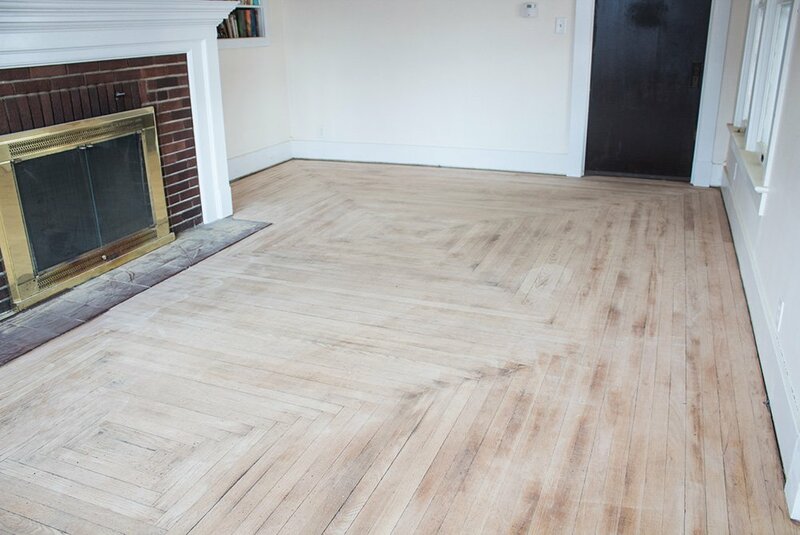 It might be way easier to do an even sanding job on a newer floor that hasn’t had 100 years to move around and become uneven. I wouldn’t know. My father, who is noticeably stronger than me, fared a bit better in the dining room. But, still, not a pro level. See the blotches? And that’s just the sander. They have access to better finishes, too. Do you really think the polyurethane you can buy at Home Depot is really the strongest floor finish on the market? Of course not. The stuff the pros use is significantly stronger, and of course, exponentially more difficult to apply. Theoretically, you’re just pushing a big, wheeled machine around. And maybe, if you get a machine that has a lever to raise and lower the drum, that will be the case. But the sander I rented this time used a rocking motion to raise and lower the drum. That meant that to keep the drum in contact with the floor, not only did I have to push the machine forward, but I needed to be pushing the machine into the floor, else it would rock backward and the drum would lift off and barely sand the floor. The sander is heavy. After a couple hours of this, I was exhausted, and my arms felt like they were about to fall off. 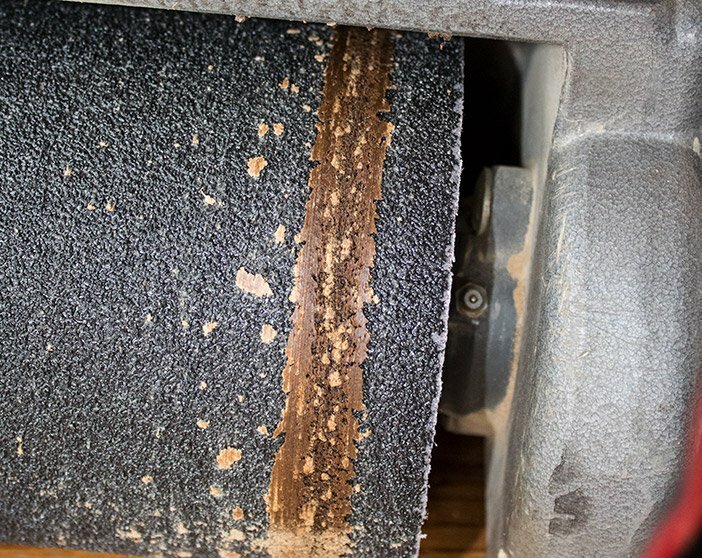 Both my sander and edger had remarkably good dust collection systems. Despite this, there was still an obvious layer of dust coating everything, including in the rooms I didn’t sand, when I was done. 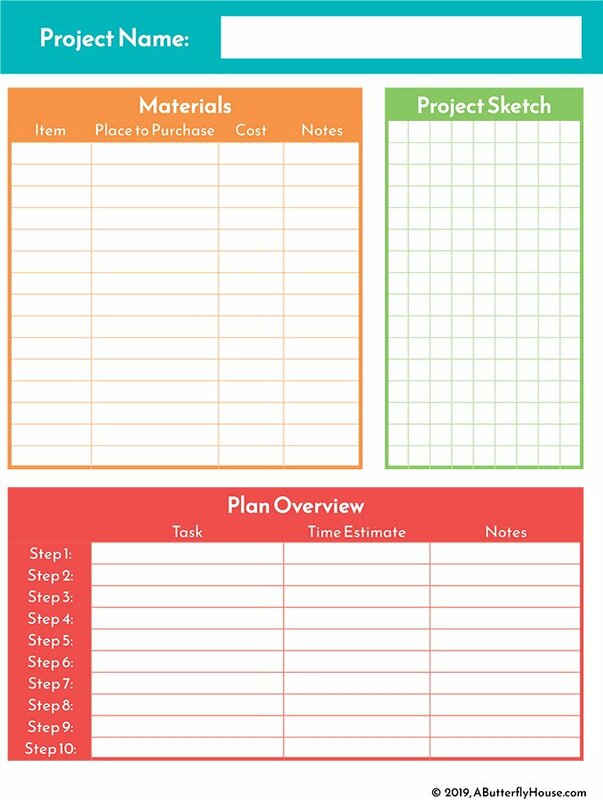 Pros will be meticulous about cleaning up their messes, and have the tools and routines to make that easy. 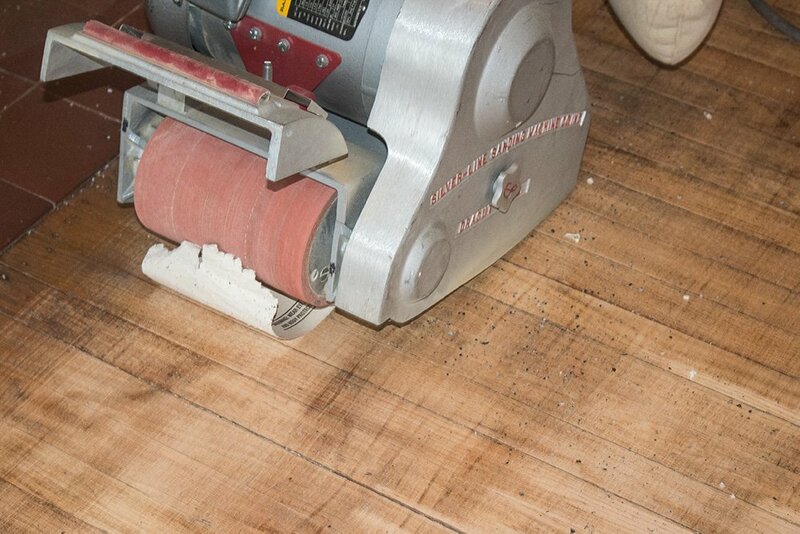 This is especially important in a floor refinishing job, where sawdust getting into a drying finish can destroy it. To give you an idea of the dust, when I finished sanding my floor, I went over it three separate times with a vacuum cleaner before applying finish, because that’s what it took for me to be confident there wasn’t anymore sawdust on the floor. This last reason is more an accumulation of everything above. 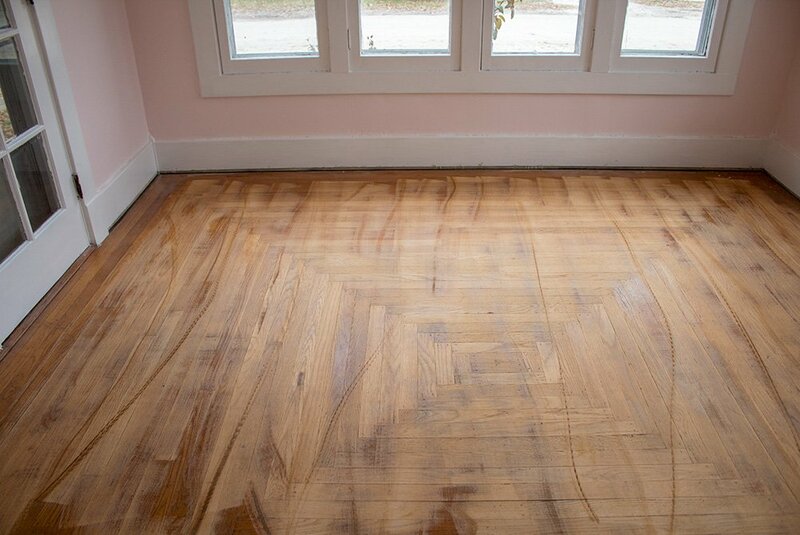 Pros will do a noticeably better job at refinishing your floors than you will. They have better equipment, better products and more experience. While this can be said about almost any DIY task, the difference between a pro job and an amateur job is particularly obvious with hardwood floors. 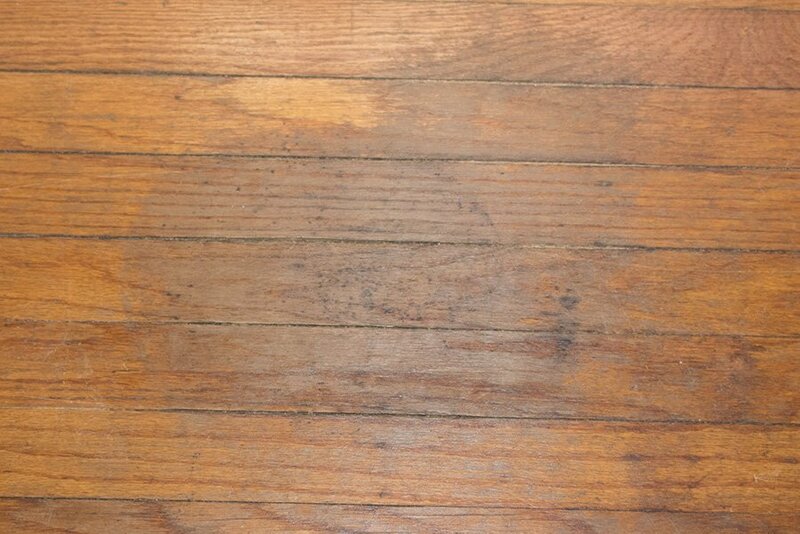 So, Should You Ever DIY Refinishing Hardwood Floors? And your house is not worth much money (for a house; $100,000 or less) then go for it. My reasoning here is that the cost of hiring a pro to refinish your floors will not be recouped when you sell your house. And if the wood floors are truly in terrible condition, the sell-ability of the house will increase even with a mediocre job. But if you live in a nice house, one that is valued well above $100,000, hire someone. While I found it difficult to leave large gouges in the floor like many websites claimed I might do, there are many minor imperfections in places that a pro would have done perfectly. All in all, a pro will do a significantly better job than you, and if your house is truly a valuable investment, it’s worth hiring someone. Still Thinking of DIY-ing Your Floors? Cool, me too; I still have another two rooms to do. I’ll be rooting for you. 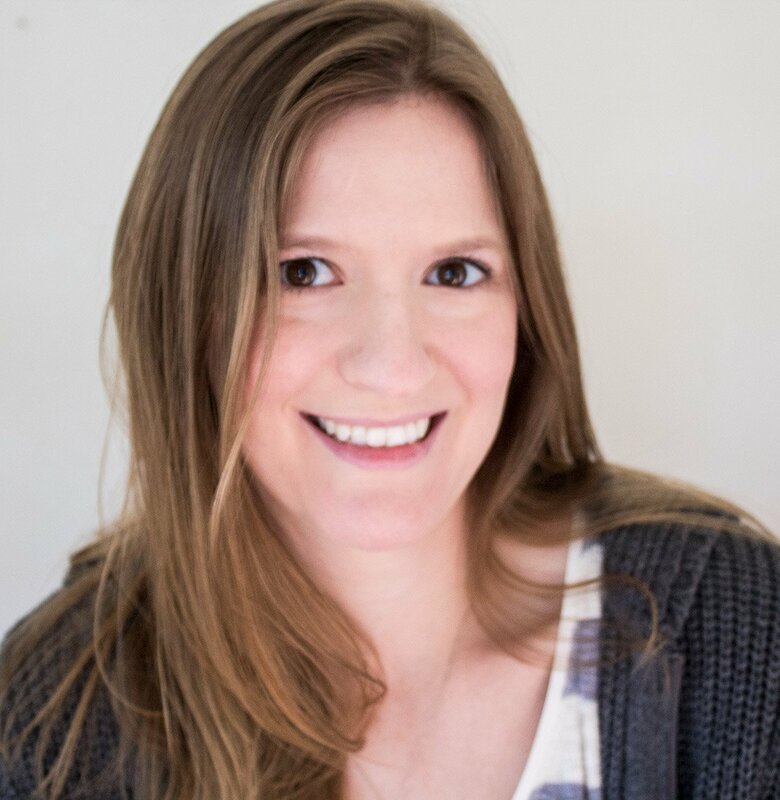 And if you’re looking for all the resources you can get your hands on, check out my other two posts: 8 Tips for Refinishing Hardwood Floors, and What to Do if You Get a Bad Floor Sander. Good luck! I’d love to hear how it goes; I still have another two rooms to refinish, after all!